It's raining season again in Singapore. What's good about this weather is that it helps to cool down my body which have been on the high ever since I started chemotheraphy. Without realising, 6 cycles of intensive treatment have passed! Thank God for keeping my body strong to go through the treatments without much complications. 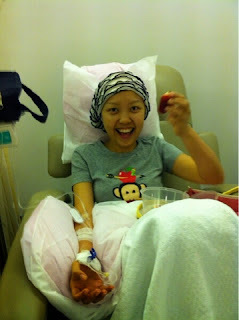 Anyway, a cheery photo during my last treatment! Let's keep the Spirit high by trusting God! Yay!